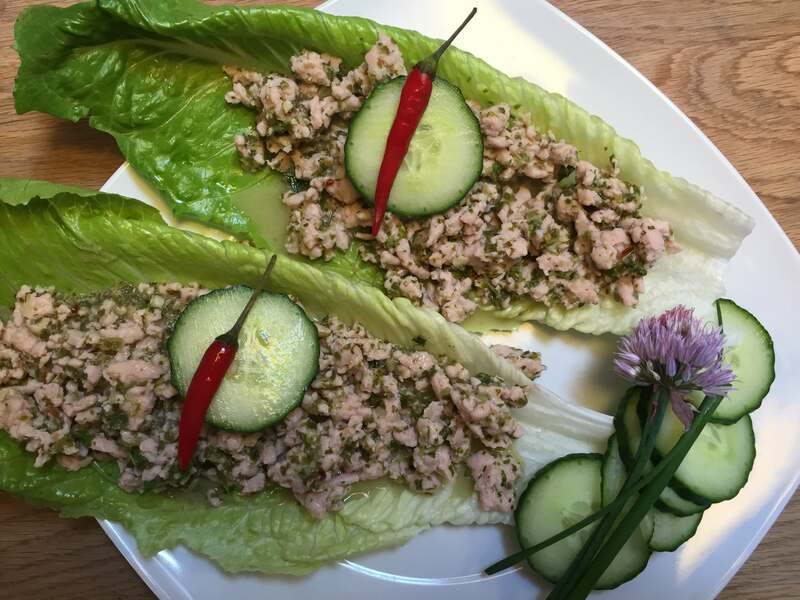 Thai chicken salad, so tasty and so healthy. This salad is so delicious it is fresh, spicy and full of healthy herbs. 1-2 table spoons toasted rice (Khao Khua) You can buy toasted rice ready-made or make your own by toasting dry white rice in a pan until golden brown and blend in a powerful blender or crush in a mortar, this will give a nice nutty flavour and it bind the juices in the salad. Add all your herbs, garlic, ginger, 1/2 of your lime juice and chilli to your food processor and blend, not too much you like to keep it chunky. don’t be shy with the herbs they have so many health benefits.